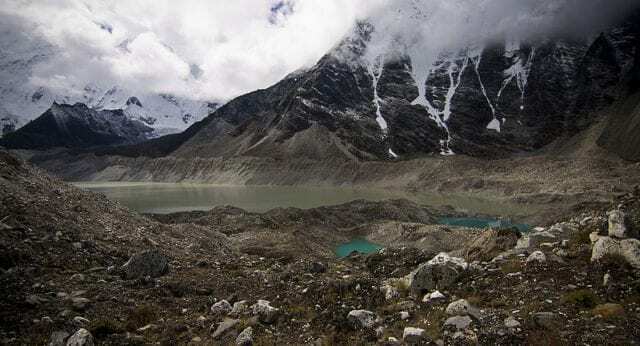 A project team recently drained a glacial lake in Nepal — Lake Imja — to reduce the threat of catastrophic flooding and mudslides. Hundreds of glacial lakes have appeared in Nepal as the climate has warmed and glaciers have retreated, posing deadly threats to people and infrastructure that Nepal has contributed very little in creating. Lake Imja was “small and unremarkable,” posing little threat to a nearby village and local infrastructure in the early 1980’s. It had more than tripled in size by 2014, held back by a glacial moraine, a natural dam that holds back the lake’s waters, according to a news report. An earthquake in 2015 led some 12,000 villagers in the village of Surke to evacuate due to fear the moraine would collapse and lead to massive floods and mudslides. The moraine held, but it awakened government and international authorities to the catastrophic threats Nepal’s swelling glacial lakes pose, and the population’s vulnerability to them. A multilateral project to drain Lake Imja began in 2016, which had grown to become 150 meters deep and two kilometers (1.2 miles) wide. Making use of yaks and helicopters to transport people and equipment to the high-altitude site, workers dug a drainage canal and siphoned off enough water to lower the lake’s level by 3.5 meters (11.5 ft.). The project cost $7.4 million. More than 80 percent of the funds came from the UN Global Environment Facility (GEF). Run by the World Bank, GEF provides financing for green development and infrastructure projects in developing and lesser developed countries worldwide. The UN Development Program also contributed to the project. Nepal’s government and economy rely heavily on its much larger, wealthier neighbors, i.e. China and India, as well as international aid, for infrastructure and consumer products and services. Those sources accounted for 12 percent of the country’s GDP in the last fiscal year, the report highlights. “With a paltry economy and 26 million people, Nepal has a tiny carbon footprint compared to its giant patrons China and India, major polluters that are home to a third of humanity,” reporter Paavan Mathema points out. That leaves Nepalese leaders feeling that they are paying the costs for problems they have done little, if anything, to create. They are requesting additional assistance from the global community to adapt to the changing climate.